Born 1901 in Illinois, his original name in the 1930 census was that of Paul Joseph Bergl. His parents were from Czechoslovakia. Joe had been quite a ladies man. He was married to a woman named Marie who was also Czech. Joe was the typical successful business man who never turned away a client. Joe started a used car business. Cars in those days were really selling. Bergl had two locations, one situated at 5346 W. 22nd and another at 2211 Austin boulevard. 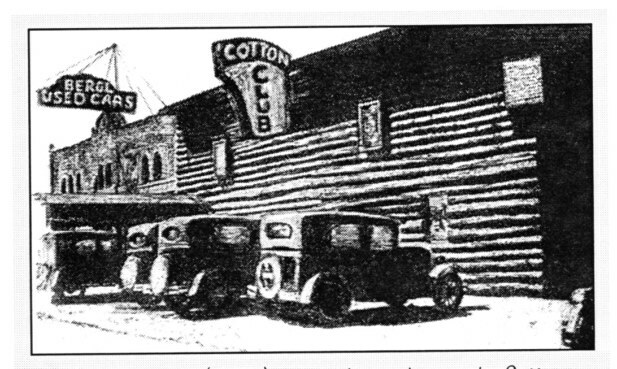 One just happened to have a common wall shared with none other than Ralph Capone's Cotton Club in Cicero. One can understand how Joe had become associated with the gangster neighbours. One can only assume that they visited Joe for a car, repairs or modifications. 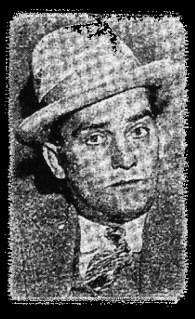 The favors and special jobs certainly earned Joe a good name with the Capone mob. One trait the Capone mob really loved in a person was the ability to keep one's mouth shut. Joe did what was asked and never asked questions. He probably knew that it wasn't his place or concern. That was a lesson that fell on deaf ears to another Cicero Capone neighbour by the name of Theodore Anton. Being associated with gangsters did not mean that Joe was immune to life's daily happenings. On the evening of March 14, 1930, Joe and Marie were held up in front of 2449 South Ridgeway Ave. by bandits who made off $500 cash and $2100 in jewelry. The Bergl's had been visiting friends at the time. 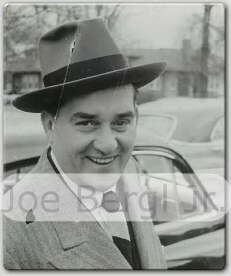 Joe Bergl in the late 1940's. Fred Goetz had a car from Bergl's, so did Gus Winkeler. Dillinger gang members and people like Frank Nash also had used Bergl's famous cars. Winkeler was partnered with Bergl on some deals. Whenever questioned by police, Bergl admitted that he simply loaned some money from Winkeler. Bergl was even as far as being implicated with Machine gun Kelly and somehow tied to the Kansas city massacre in which several lawmen where cold bloodedly assassinated. One girl even testified that she had seen Bergl help get Kelly a car. In September of 1933, Bergl was brought into trial when a policeman was killed and the bandit's car was revealed to have been equipped with bullet proof glass and a police radio installed by Bergl's garage. They tried to get him on an accessory to murder charge that didn't end up sticking. In November of that same year Bergl had been freed on the charge of harboring George "Machine Gun " Kelly who had been on the lam. There too they had alleged that Kelly was driving a Bergl car. Just as legal woes stepped in, so did tragedy. 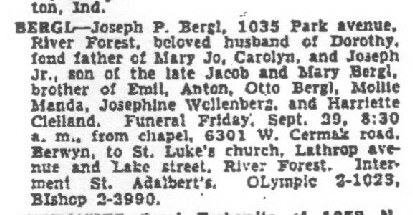 Joe Bergl's estranged wife Marie was killed in a car accident in August of 1936. The car she was riding in overturned. The driver survived, but Marie died shortly at Westlake Hospital in Melrose park. Joe still cared for Marie. Joseph Bergl's auto dealer next to Ralph Capone's Cotton club in Cicero. It was here that he used to gangsterize gangland's autos. (Photo by kind permission of Bill Helmer). Joe dated many women. He loved women and they loved him. He dressed to the nines and hung around in clubs that gangsters frequented. He was a gangster's associate. Joe used to carry a pocketful of diamonds that he liked to roll around in his hands. This was a practice that had also been followed by Big Jim Colosimo. Joe had another marriage that was short lived to a woman named Claire. It had made the news in that she hit Joe with ashtrays, lamps etc.. But that alone did not get the judge's sympathy. The marriage did end a short while after. She had been a heavy drinker and stayed out all hours. Joe finally fell in love with a showgirl at Chicago's Chez Paree club. She was the poster girl for alot of the Chez Paree advertisements. Her name was Dorothy Johnson. They fell in love and were married. Dorothy gave birth to Joe Jr.
What the area looked like in later years. 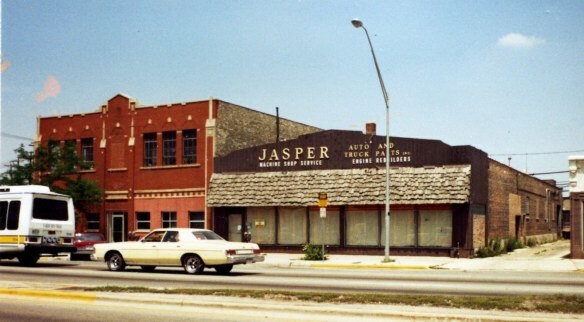 Bergl auto was at the left and the Cotton Club is replaced by Jasper Auto and truck parts. That means installing armour plating on the body, installing half inch bullet proof glass, a system of oil squirting on the tail pipe in order to cause smokescreens for getaways. Installing a siren, police radio and all the other new fangled contraptions in order to evade pursuit and live another day. When Capone's car (without Capone in it) had been riddled by the Northsiders, Al had a Cadillac specially modified to protect him. The car was purchased at a Cadillac dealership, but I'm sure Bergl had modified something on there. 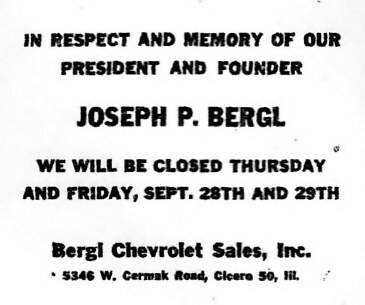 Bergl's Auto had two locations for selling autos. 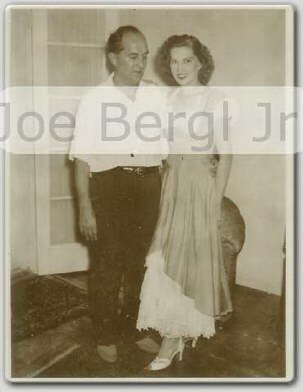 Joe Bergl and his lovely wife ex Chez Paree showgirl Dorothy. One time Joe got a kick out of giving a waiter on a train to Florida a $10,000 bill to pay for the dinner tab owed. He loved screwing with people out of jest. His party all had a good laugh. 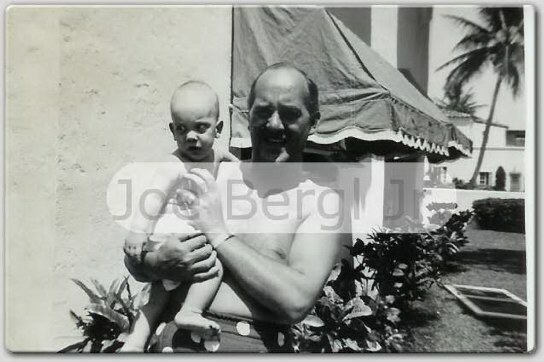 Joe Bergl with his son Joe Bergl Jr. Sadly, Joe Sr. will not live long after this photo. On September 26, 1950, Joseph Bergl suddenly dies at the age of 49. Many people were saddened by the news of his sudden death. His funeral equalled that of a gangland figure, even though he was not. The people who showed up there were friends, employees, family and people who just liked Joe for the kind man he was. Sure gangland didn't forget a friend of the Outfit either. For being upstanding, a few of the boys showed up. Joe's funeral turned out 14 flower cars with some of the flowers being sent by the boys in the Outfit. Louis Campagna's signature had appeared in the register. Joe Bergl is interred at St Adalbert's Cemetary. This showed how much his employees were dedicated to the man. After Joe's death, the dealership was sold to George Pavlicek. He had been a former salesman for Joe. Dorothy couldn't run the company as Chevorlet wouldn't allow a woman to run a dealership at that time. My special thanks to Joseph Bergl Jr. for his help with photos, info and most of all permission. Without him and his sister, this page would not be possible. Thanks goes out again to my friend Bill Helmer for his photos.